Enjoy absolute privacy and limitless pampering at The Hideaway, Fusion Resort Cam Ranh’s new “resort within a resort”. Perched atop a pristine sand dune facing the ocean, The Hideaway’s secluded luxury pool villas are crafted from natural materials, with extra-plush bedding, custom bathtubs and breezy outdoor lounge space as standard. Of course, the real draw is Fusion’s signature “all spa-inclusive” programme, which allows guests to indulge in unlimited treatments throughout their stay. Pregnancy-friendly options include mum-to-be massages, scrubs and reflexology treatments, along with facials, manicures and pedicures to ensure that you maintain your glow as you grow. If you prefer your babymoon within striking distance of a big city (and its world-class medical facilities), look no further than Sofitel Singapore Sentosa. 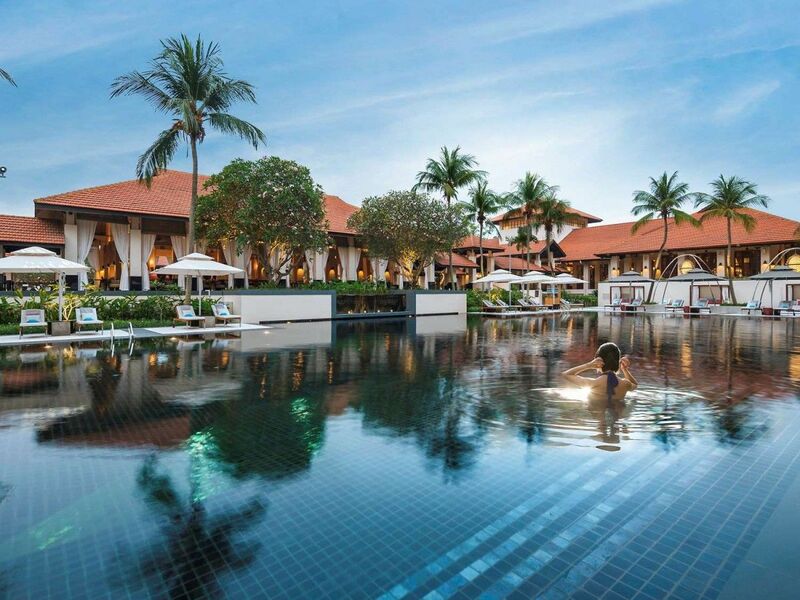 Offering an array of rooms, suites and villas—all with Sofitel’s signature French styling—the resort centres around an inviting pool nestled within its courtyard, where you’ll find plenty of well-shaded spots to unwind as peacocks strut past your lounger. Their dedicated “Babymoon Experience” package includes accommodation, breakfast, a spa gift for the expectant mum and a couple’s massage at the resort’s tropical garden-surrounded spa, which boasts a mud pool and waterfalls to bathe in. Add in restaurants offering delectable dining and panoramic South China Sea views, and you may struggle to tear yourself away. Whether your pregnancy has you craving adventure or just long afternoon naps, The Lombok Lodge offers the perfect balance between luxury and (bump-friendly) exploration. With just nine exclusive ocean-view suites, the property offers the ultimate in privacy and comfort—think private terraces, outdoor showers and Hermès amenities. Their dedicated Babymoon Package includes four night’s accommodation in a luxury lodge suite, return transfers, daily breakfast and five-course dinner for two, a pregnancy-safe bath ritual, massage and facial, and a pregnancy yoga class during your stay. If you somehow tire of all that relaxation, the gorgeous Gili Islands, home to world-class snorkelling opportunities, are just a ten-minute boat ride away. Shake off those preconceptions of tourist-packed Thailand—Trisara Phuket delivers secluded luxury in style. Perched on a private bay along Phuket’s north-west coast, Trisara’s spacious suites and villas each boast their own wow-worthy infinity pool along with sweeping Andaman Ocean views. Their Romantic Escape package has babymoon written all over it, and includes access to a beachfront cabana with champagne, canapes and an hour-long couple’s massage, along with daily breakfast and private airport transfers. If you manage to prise yourself from your sundeck, prenatal yoga classes, complimentary water-sports and private island cruises await—with in-house photographers on-hand to capture unforgettable moments, too. Boasting crystal-clear oceans, pristine white beaches and three private islands, babymoon destinations don’t come much more blissed-out than Kanuhura Maldives. Their range of bungalows and villas, nestled on the beach or suspended over the resort’s lagoon, deliver castaway chic in spades—think overwater hammocks, open-air bathtubs and spectacular sunsets. Their Babymoon Package comes loaded with extra-special experiences, including mother and father-to-be massages at the spa, a beach couple yoga session, baby food cooking class, gender reveal cake, daily healthy snack platter, and even a tree planting ceremony in honour of your upcoming arrival.